No more driving the road hoping not to get stopped, I finally have an Irish driving licence! It only took 7 week and a lot of stress but it’s finally here. Here is all you need to know about swapping a foreign licence over to an Irish one. Go to the embassy of that country and get a translation. This cost me 3 euro in the South Korean embassy in Dublin. It was a painless process that just involved showing my Korean license, filling out some forms, presenting my i.d. and I had it within 20 minutes. Go for an eyesight exam. Print the eye test page from the NDLS website, take it along with you and get your eyes tested. Then get it signed and stamped. As a student, this cost me 20 euro. * Be aware that in some towns, it can take 2 weeks to get an eye test. Fill out the application form. You can find this on the NDLS website. Go to the nearest NDLS centre and hand in these documents. It is advisable to book an appointment online to avoid long delays. The payment fee is 55 euro. In the case of people swapping a South Korean driving licence you need to decide if you wish to keep the D categories on your licence. If you do, you need to print the medical check forms and complete that. If you don’t, you need to fill out the Surrender forms. You can find this on the NDLS website. I applied for my Irish licence on the 4th September. I walked in off the street with everything you could possibly need and sat with the lady. She had never swapped over a South Korean one and was thoroughly confused by the entire thing. She rang everyone and their neighbour and even though I had all the required documents, it took 2 hours to complete the application!!!! I didn’t mind too much as she kept apologising. She warned me that it would probably be sent back as she really didn’t know what to include with the application and she gave me a number to call in three weeks to check up on the progress. Almost 3 weeks later, I receive an email from NDLS stating that their was an issue and could I possibly send on the original translation from the embassy. Understandable. As it was my only copy, I sent it by registered post which added a cost of 6 euro to the bill. I thought this was the only issue and expected my licence in a week or two. Two weeks later, I receive another email from NDLS asking if I want to keep the D categories on my licence. If I do, then I need to get a medical check. If I don’t I need to fill out the surrender form. By this stage, I had had enough. It was a vicious cycle of no one knowing anything. So I called them to voice my opinions. It takes about 5 minutes to be connected while they go through every option under the sun. Then I was put through to a lady and I explained the situation. Was it too much to be told of all the issues in the one go? I don’t have the time or money to be filling out and posting additional forms. She was not at all sympathetic so I decided to write a complaint via their website but surprise surprise, I still haven’t received a reply. I had no choice but to send the surrender form and finally today, after 7 weeks of waiting and 85 euro out of my pocket, I have the licence!!!!! Don’t be in a rush for it because this is a long process. Don’t expect people to know what their doing, because clearly they don’t. Be ready to send on additional forms. Send the original of the embassy form but keep a copy yourself. Walk in off the street at a random time and you might be lucky enough to find a space. It worked for me even though I had been told that there weren’t spaces for 2 weeks. Feel free to comment on your experiences or ask any questions! 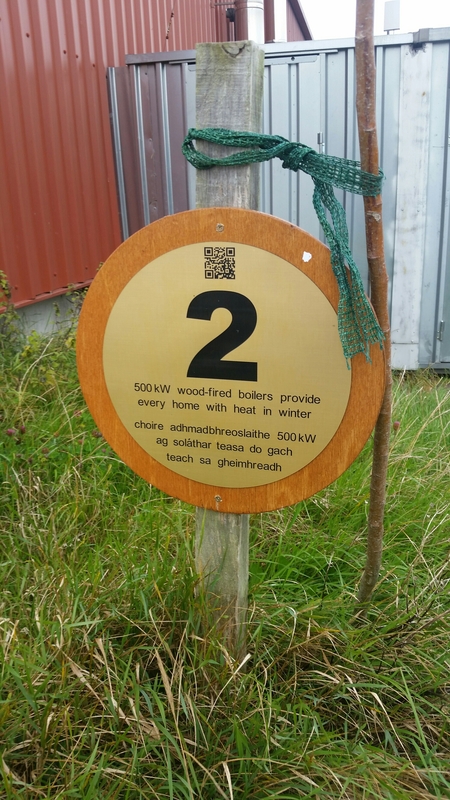 I’m back in Ireland and with the nation turning more green and a range of alternative living options available, I decided to visit Cloughjordan Ecovillage to see sustainable living in action. Moneygall is in North Tipperary and approximately from Moneygall. From the motorway, take exit 23 to Moneygall and then follow the signs to Cloughjordan. 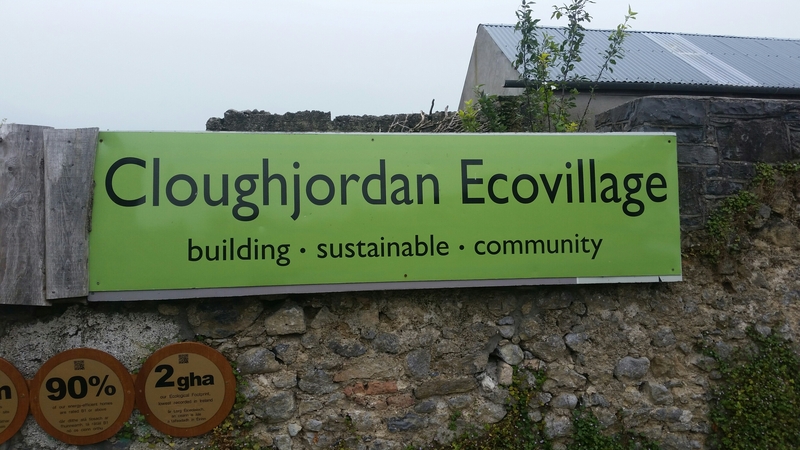 When you arrive in Cloughjordan, the Ecovillage is approximately half way down the Main Street. It is at a small 4 way intersection, opposite a church. Do you have to take a tour? While you are free to drive into the village and look around, you must remember that there are people living here and to respect their privacy and security, it is recommended that you take a tour. You also won’t get the full benefit of knowledge if you just ramble around alone. There are free tours every Saturday and Sunday at 3pm. I met the guide at the Main Street entrance or you can meet at Sheelagh na Tigh which is a little cafe on the Main Street. 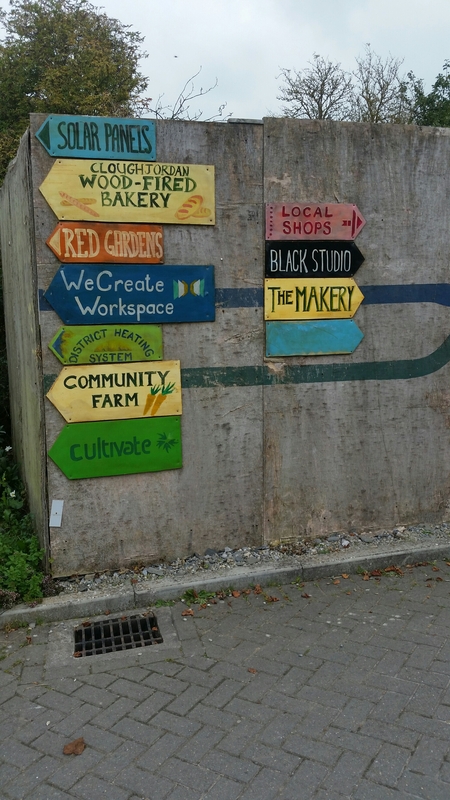 If you have a group or you wish to participate in a workshop or so on, you can email edvisits@thevillage.ie They have these kind of visits all the time and are very accommodating to groups. Ecovillages are urban or rural communities of people who strive to integrate a supportive social environment with a low impact way of life. To achieve this, they integrate various aspects of ecological design, permaculture, ecological building, green production, alternative energy, community building practices, and much more. 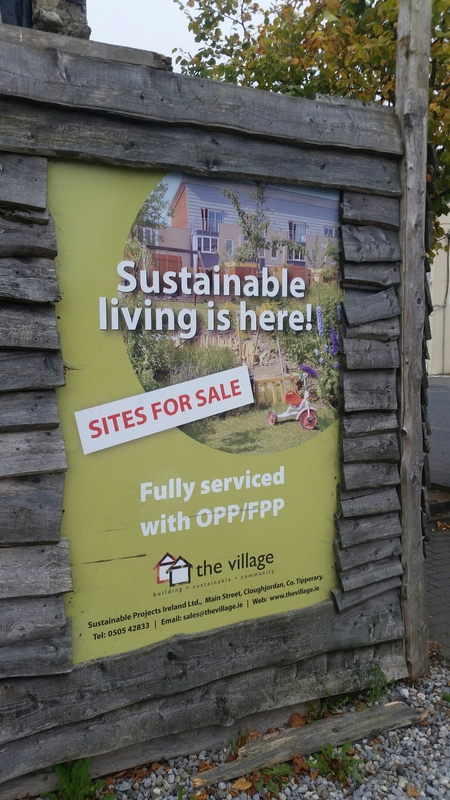 The Ecovillage in Cloughjordan is the first of its kind in Ireland and leads the way for the future of sustainable living in Ireland. 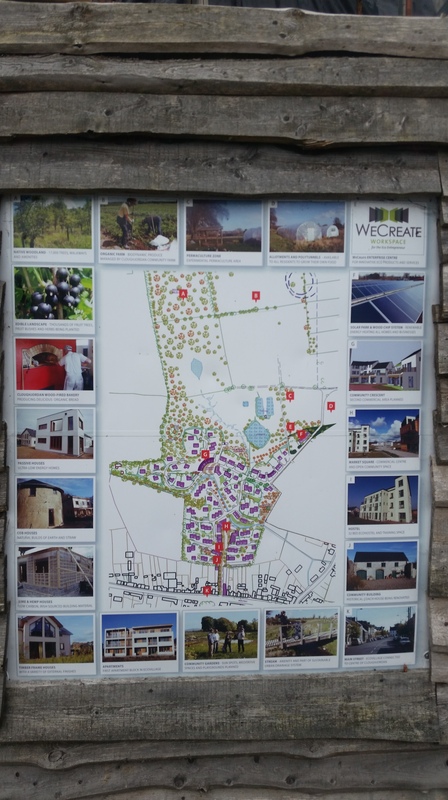 It is located on 67 acres and has a community farm, woodland, allotments, houses, hostel and Enterprise centre. The best way to understand is to take a tour and learn from the guide and that’s what I did earlier today. The tour starts with a little introduction of everyone in the group. My group had 2 foreigners and 2 Irish so a nice mix of people. Looking at the map, it was pointed out that the village is divided into thirds. One third to houses and apartments, one third to the farm and allotments and one third to woodland. Djangos Hostel seen on the left. We continued walking and saw examples of the various types of houses built in the village. Among others there are Cob, Timber Frame, Hemp crete and all cedar houses. 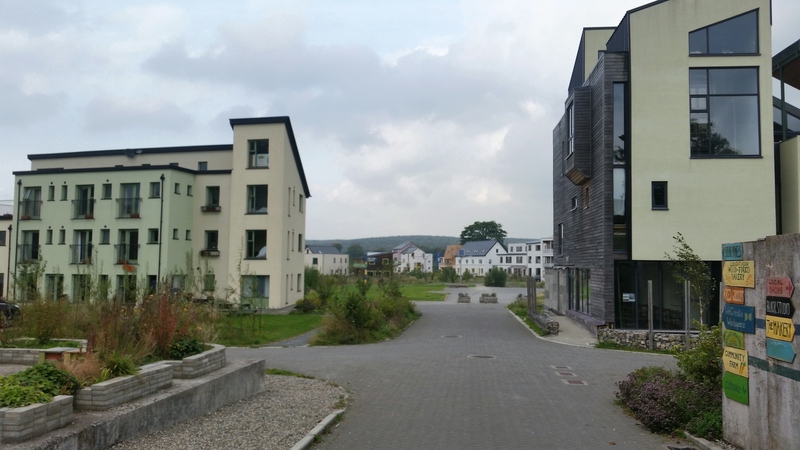 All houses are low energy and share hi spec broadband as well as a community heating system. The village has a 2gha rating which I believe is the lowest in Ireland and they are working on lowering that number. The community heating system is very interesting . Two 500 Kilo watt wood fired burners supply every home with heat. The cost is divided among the residents. Energy is also provided by solar panels which can be seen on the tour. We continued on to the allotments. It is here that you can see research in action. 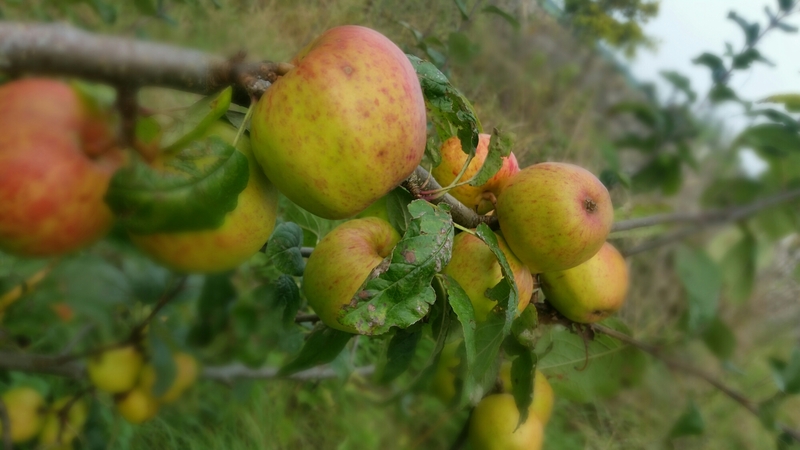 One resident has his own allotment where he is researching growing techniques and so on. 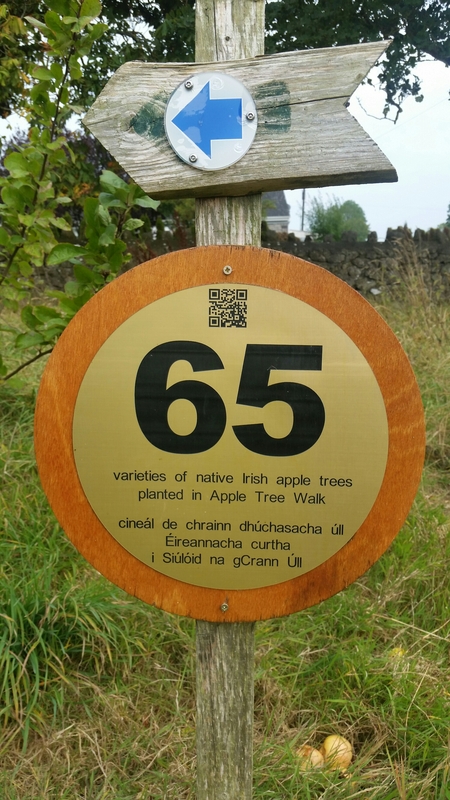 On the apple walk, you’ll find every type of apple you can imagine. 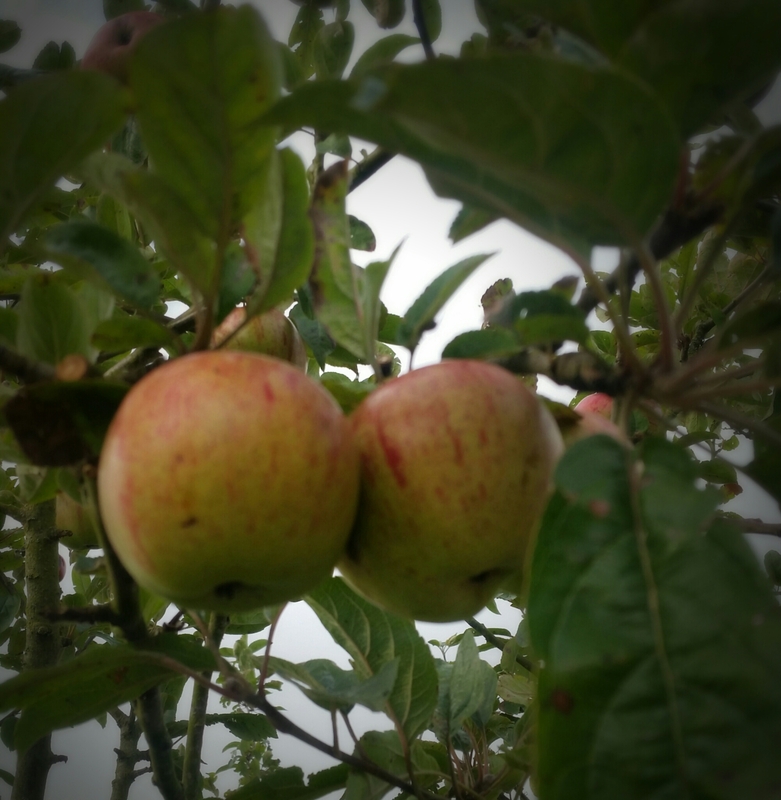 Luckily, we were allowed to eat some of the ripe ones and they were juicy and delicious. There’s something to be said about eating fruit straight off the tree. Our guide even brough along a spreadsheet with all the information on all the apples. 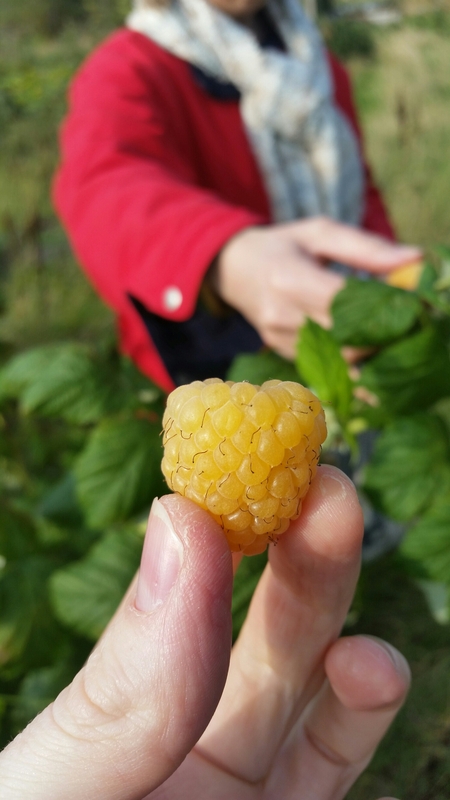 When we managed to pull ourselves away from eating the apples, we started into the yellow raspberries. Eventually, we continued on our way and off to the farm. This is a community farm where members can collect their vegetables every week. Anyone can become a member so check out their website if you are interested. We finished our tour by sampling some more delicious fruit that we found on the way. A few things struck me about the village. The people seem extremely innovative, motivated and dedicated. Along the way, we were introduced to projects and plans that were either ongoing or in the process of approval. The aim of the village is learning. Everyone is open to learning about sustainable living or teaching it to people like me on tours. For example, the drainage system is quite unique. In several areas, depressions can be seen. These are called Swales. When severe rain comes, the water is collected in these swales and they fill like lakes. Then, the water can slowly permeate through the ground. This prevents flooding to the village. This is the way of the future and the possibilities are endless. I was so inspired to hear of the work already done in the village but can’t help but think of the possibilities for the future. With new methods coming on board all the time, this village is only just growing. Absolutely. I learned so much from my visit and found it quite innovative. It would be a great visit for families also. You can find out more details on their website http://www.thevillage.com, on Facebook or on Twitter. Huge thanks to everyone who took the time to vote for the blog. The good news is that it made the final of Blog Awards Ireland 2015! This is a big step, a serious achievement and one that took me a little by surprise. Last year, my blog made the long list and went no further. When it made the short list this year, I was delighted and didn’t expect it to make the final. But, the email arrived on Tuesday and Whatawaygook is in the final 10 in the Diaspora category! This wouldn’t have been possible without all the readers and followers voting so huge thanks! I cannot believe I made it to this year’s Blog Awards Ireland shortlist for Best Diaspora blog.Thanks to everyone for your support and encouragement. It’s because of you that I made it this far. It’s my first year to make it to the shortlist and I would love to proceed to the final. You can help! Simply follow this link and vote for “whatawaygook” I’m the last on the list so that will help you find me. Share this with your friends, family and anyone you know and let’s make this happen! One more link for good luck! Whatawaygook makes the short list! I’m sossssssooooooo excited that this blog made the Short list of this year’s Blog Awards Ireland under the Best Diaspora Category! 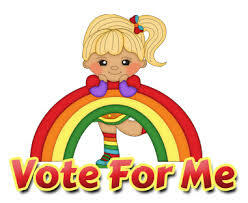 From here, finalists are chosen by PUBLIC VOTING so I’ll need your help. Voting starts on September 7th so stay tuned to Whatawaygook to find out how to vote! Thanks for reading! “Whatawaygook” makes Blog Awards Ireland Long list! Thanks to Blog Awards Ireland for adding “Whatawaygook” to the Long List of this year’s awards.